Thursday at Blackbird Tattoo: FMRL Presents Shadowbody (Cher Von & Adam Koan), Brady Sharp, and Me! I just wanted to plug a show at Blackbird Tattoo on Thursday, November 3 at 9pm. It’s organized by FMRL Arts, and it features Shadowbody, a duo comprised of Cher Von on percussion, vocals, and loops and Adam Koan performing butoh-based body movement. As I’ve mentioned a few times before, Cher Von is one of my favorite performers. If you’d like to learn more about butoh, check out this Wikipedia entry. Check out the streams below and see if it’s your thing. More info on the Facebook event page. 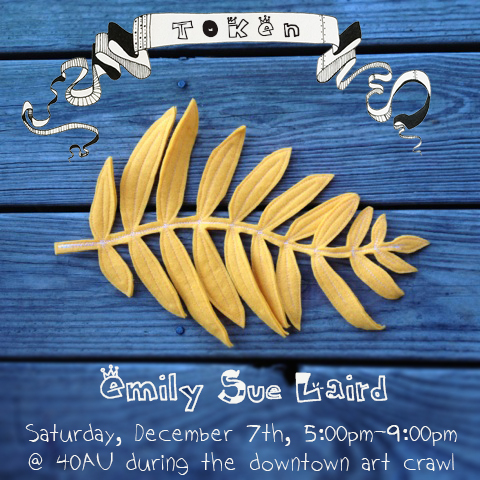 Thursday, November 3, 9 p.m.
At 40AU in the Arcade is Token: A Solo Exhibition by Emily Sue Laird. The Facebook event page says, “Balancing human-made materials – such as lace, felt, cotton, canvas, and velvet – with the fragile, transitory organic matter of mushrooms, paper, ink, wood, and moss, Emily invites participants to explore domestic elements through play and discovery. Felt leaves become placemats; mushrooms become shelves; fabric becomes forest; home becomes adventure.” The exhibition comments on art as a commodity, but I won’t spoil the fun with any further details. Just go see it, and you’ll soon understand. Over at Arts & Music @ Wedgewood/Houston‘s Ground Floor gallery, Erica Ciccarone and I are exhibiting a new installation called #openaccess. (Facebook event page here.) We’re constructing a 6 1/2 foot cube covered in white material. Inside the cube (but hidden to the audience) is Erica. She poses in front of a green screen in various costumes and scenarios, yet the audience never sees this. The sides of the cube merely reveal shadowy clues of what’s happening inside. What you DO see is projected on the front of the cube … pictures taken inside the cube minutes before … embedded inside social media posts. So the audience never sees what is happening live; they merely see the after effects on a time delay. The projected image shows a desktop full of web browser windows. Facebook, Twitter, Google +, etc. The pages constantly update as the new images come through. While the work will be up all month, the live portion with Erica in the cube only happens Saturday night from 5 to 8 p.m. #openaccess will also features new works from Mandy Brown, Heidi Martin Kuster and Janet Decker Yanez. Finish off the night by supporting a good cause and enjoying various interpretations of Tom Waits songs at the Five Spot. It’s the 8th Annual Tom Waits Tribute & Benefit for Second Harvest Food Bank. Click the links for the various addresses and show times.